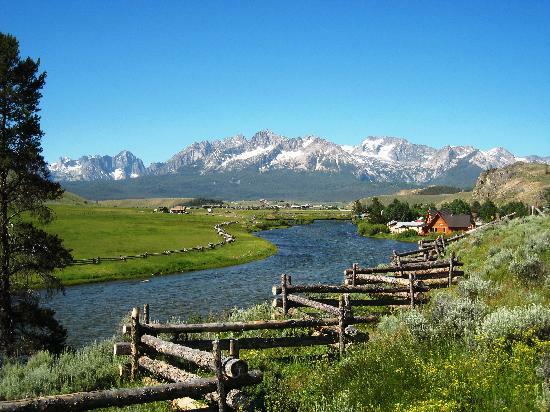 'Tis time once again to head off to The Sawtooths and the headwaters of The Salmon River. This is where modern Huck Finns and Tom Sawyers go to hide out and play. It's also where Cinderella and Tinkerbell hang out incognito. So, what's on the agenda and why are we going to Salmon Country? If you immediately guessed "because of that Salmon Thang website," ya dun good! Yep, that's the reason we're going up to the river. We started the website as a result of our May 7th trip last year. We realized the BLM was probably never going to get its act together to produce the river guide we volunteered to help create. We also realized the BLM would never be able to provide the type of information people love to read about the river. So, we launched Salmon River Idaho Dot Net as soon as we returned home from that trip. In just one year, the website is a huge success. It recently passed the 50,000 pageview benchmark. In one year we've posted well over 150 articles and--get this--over 700 photos and graphics! Meanwhile, on February 6th, we actually started paying Google real money to place our ads for our website onto other people's websites. Since then we've had over 75,000 "impressions" of our ads on other websites. We designed the ad campaign to emphasize "impressions" versus "clicks." We have received nearly 500 clicks--that's actually what you pay for in such an online ad campaign but our cost so far is only about $110. We're pleased. Our Salmon River Idaho Facebook has 291 Friends and they are very active in sharing our content. We've had over a dozen "shares" of the Peak Flow Contest. We're made some great new online Friends that we are looking forward to meeting in person this year. When we started this project a year ago, we set modest goals and expectations. We have far exceeded our original ideas about what might evolve out of this project. We continue to have two primary purposes for doing that Salmon Thang: A) It's an awesome hobby and B) It's going to get us up to The Salmon River one week each month from May through September. That means we will have spent up to five weeks in a really great place. If we were not doing the website, there's a 100% chance we wouldn't be going to Salmon Country Monday afternoon. Why would we need or want to go when the weather is still cold? Nope, we'd stay home. The Salmon Thang is doing its job--it's getting us off our anatomy here and out on the road again, seeing things, talking to people, selling ads, promoting the project and so forth. It's keeping us totally engaged in Salmon Country and solidifying what has actually become a viable "brand" during the past year. 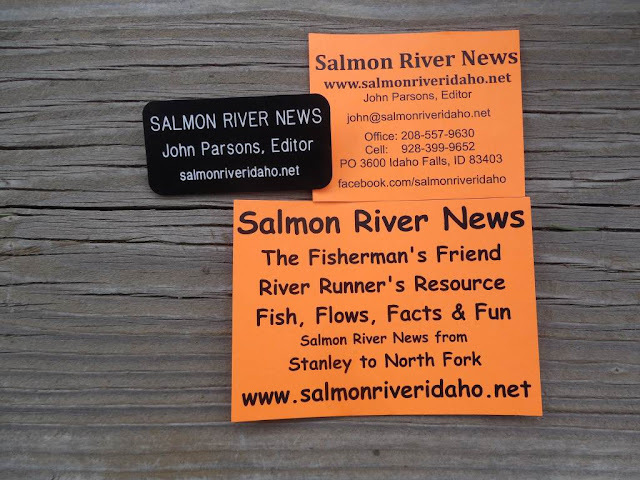 "Salmon River News" is now well known to the locals from Stanley to North Fork. We're on their radar. We're no longer a novelty. We proved we could stick with it through the winter and produce exciting and educational coverage of the winter ice jams and steelhead season. That's what it takes to make your name and reputation up in Salmon Country--"sticking with it." All too many folks are "fair weather friends" of that neck of the woods. When the snow flies and the river ices over, they don't pay any attention to The Salmon. We broke that mold and we're earned some well deserved respect for it. This might sound like braggin' but it's not. It's just the facts of life up there. We're pretty danged excited about this project. Last year this time, we didn't have a clue what to do or how to do it. We bought a domain name and just plunged in and flailed away, hoping something good would happen. It did. This year we have a much better idea of what to do, how to do it, when to do it and so forth. That's why we're heading north in early May before everyone gets busy with the summer tourism crush. People will have time to talk now, time to visit--quality time. The connections we make and renew next week will pay dividends throughout this season and the years ahead. People need to see your face and shake your hand to reassure themselves you are real and actually care about them and what they do. Yesterday, we made our new season business cards and the tiny poster-ettes we put on bulletin boards. We're ready to pin on our name tag, grab a camera, camcorder and computer and get down to business. A 150-mile stretch of The Salmon River is our "news beat," as journalists are wont to say, and it's the best office we've ever had We get to roam free range alongside an awesome stretch of one of the largest, last remaining totally free flowing rivers in the Lower 48. Let the Year 2013 Salmon River Field Season Begin! WHA-WHOO! John, Sure has been fun watching the progress of the Salmon River News. Congrats and Best Wishes. I so look forward to more from the SRN about an amazing and wonderful place and all the great people who live near, visit and enjoy all its glory. Thank YOU. Once a journalist, always a journalist. And the best kind is someone who loves the topic they get to report on. Glad you are giving it your best John. It's what I admire so much about you. And this low water summer we will do some paddling on the weekends together and cook in our dutch ovens and camp and watch the river go by. And with Susun it will be that much more fun, too.